Available only to qualified customers through Mercedes-Benz Financial Services at Loeber Motors through April 30, 2019. Not everyone will qualify. 36 months lease, 10K miles per year. Payment based on MSRP of $48,695 less the suggested dealer contribution of $2,210 resulting in a total gross capitalized cost of $46,485. Excludes title, taxes, registration, license fees, insurance, dealer prep and additional options. Total monthly payments equal $18,324. $4,593 Cash due at signing includes $3,269 capitalized cost reduction, $795 acquisition fee and first month’s lease payment of $529. No security deposit required. At lease end, lessee pays for any amounts due under the lease, any official fees and taxes related to the scheduled termination, excess wear and use plus $0.25/mile over 30,000 miles, and $595 vehicle turn-in fee. Purchase option at lease end for $26,782 plus taxes (and any other fees and charges due under the applicable lease agreement) in example shown. Subject to credit approval. Specific vehicles are subject to availability and may have to be ordered. See dealer for details. Dealer not responsible for pricing errors in this advertisement. 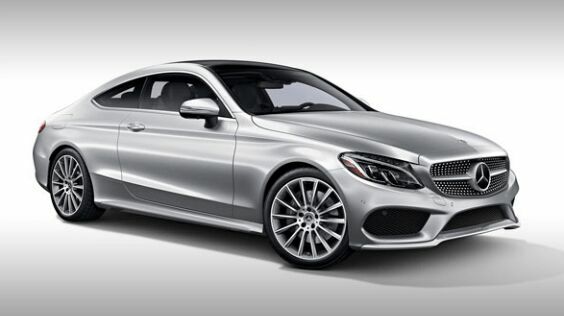 With Available Options Like AMG Line (Aluminum Pedals, AMG Line Interior, AMG Line Exterior, AMG® Body Styling, Black Fabric Headliner, Diamond Grille in Chrome, Flat-Bottom Steering Wheel, Front Brakes w/Perforated Discs, and Sport Suspension), HANDS-FREE Comfort Package, Premium Package (Blind Spot Assist, Burmester Surround Sound System, Electronic Trunk Closer, HANDS-FREE ACCESS, KEYLESS GO®, Power Folding Mirrors, Rear Cross Traffic Alert, and SiriusXM Satellite Radio), 18" AMG® 5-Spoke Wheels, 4-way Power Driver's Lumbar Support, 4-Wheel Disc Brakes, 5 Speakers, 64-Color Ambient Lighting, ABS brakes, Air Conditioning, Alloy wheels, AM/FM radio, Android Auto, Anti-whiplash front head restraints, Apple CarPlay, Auto tilt-away steering wheel, Auto-dimming door mirrors, Auto-dimming Rear-View mirror, Automatic temperature control, Brake assist, Bumpers: body-color, Child-Seat-Sensing Airbag, Compass, Delay-off headlights, Driver door bin, Driver vanity mirror, Dual front impact airbags, Dual front side impact airbags, Electronic Stability Control, Emergency communication system, Exterior Parking Camera Rear, Four wheel independent suspension, Front anti-roll bar, Front Bucket Seats, Front Center Armrest, Front dual zone A/C, Front reading lights, Fully automatic headlights, Garage door transmitter: Homelink, Genuine wood console insert, HD Radio, Head restraints memory, Heated door mirrors, Heated Front Seats, Illuminated Door Sill Panels, Illuminated entry, Illuminated Star, Knee airbag, Low tire pressure warning, MB-Tex Upholstery, Memory seat, Multifunction Sport Steering Wheel, Natural Grain Black Ash Wood Center Console, Occupant sensing airbag, Outside temperature display, Overhead airbag, Overhead console, Panic alarm, Passenger door bin, Passenger vanity mirror, Power adjustable front head restraints, Power door mirrors, Power driver seat, Power Front Seats w/Driver Memory, Power moonroof: Panorama, Power passenger seat, Power steering, Power windows, Pre-Installation for SD-Card Navigation, Radio data system, Radio: Audio 20, Rain sensing wipers, Rear anti-roll bar, Rear fog lights, Rear Spoiler, Rear window defroster, Remote keyless entry, Security system, Speed control, Speed-sensing steering, Split folding rear seat, Steering wheel memory, Steering wheel mounted audio controls, Tachometer, Telescoping steering wheel, Tilt steering wheel, Traction control, Trip computer, Turn signal indicator mirrors, Variably intermittent wipers, and Weather band radio Vehicle may not have all options as described due to automated process.